Jenny is feeling better today. She had more energy, and even walked across the hospital to attend a class about her aforementioned PICC line. All that effort might have caused an afternoon fever to return, according to Dr. Kronowitz’s physician’s assistant, Katherine Awalt — who we’ve seen many times and really like. Katie (that’s what everyone calls her … plus, I don’t know how to refer to a P.A. upon second reference, so we’re calling her Katie for now) wanted to keep Jenny at the hospital today to continue evaluating her improvement. Anyway, Jenny was feeling pretty good. This afternoon, Katie said that they want to keep her another day with hopes of releasing her in the morning. If the timing works out right, they can release her and we can still make her series of scans tomorrow. 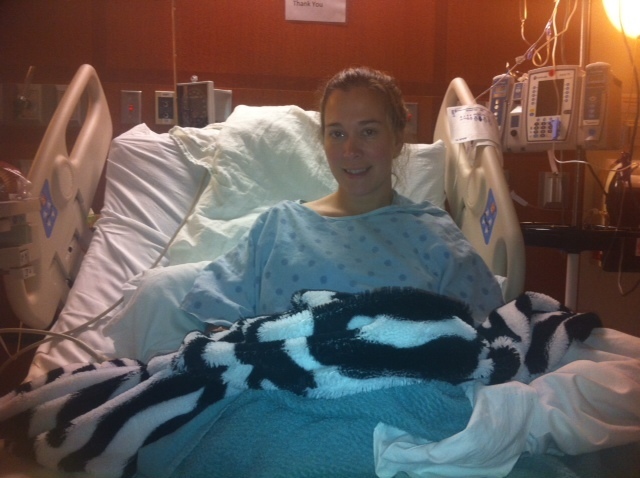 Jenny is scheduled for a bone scan, a CT scan of her abdomen, chest and pelvis and an MRI of her brain. The last part — the MRI — isn’t until 8 p.m. It will be a long day, so I’ll be wheeling her around to make sure she doesn’t overdo it. She has to listen to me … no walking! 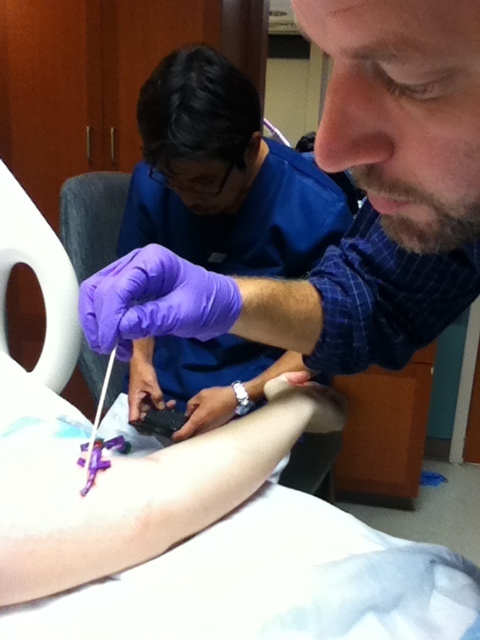 I took the second class on caring for the PICC line. Jenny went with me today. It was the third time I watched the video, because we watched it together on the hospital TV last night. So I already had fashioned my step-by-step list to change the caps, flush the lines and change the dressing. By 1 p.m., I was ready for the test. The hardest part of it all is making sure I don’t contaminate the sterile dressing package. Putting on the sterile gloves wasn’t easy, and I made the nurse uneasy as I fumbled through that. But he showed me how to do it better than I was, so that’s good. Other than that, I had the steps down. I passed. We’ll get the antibiotics from the Home Care company tomorrow. They came in today and showed us how to administer the antibiotics. She also stressed the importance of going through the proper cleaning steps and not to get lax with that repetitive cleaning, etc. It’s on my list. I will refer to it each time we do any of that stuff. Priority One is to have no more infections. So glad Jen is on the mend! Very glad to hear the good news! We’ll keep praying and believing the good news continues!! I was hoping to find an update. That was great news today. So thankful Jenny has you! So glad to hear you’re feeling better, Jen! And Alan, you are a ROCK STAR! Thank you for taking such good care of our girl (not that we’d expect anything less)! I agree! You ARE a rock star for taking care of our girl! We are so lucky you are a part of the family.